I love being outdoors and exploring new trails and new places. I think it’s important to share the experience with those around you, even if it is just telling a trek story, sharing photos, or taking people with you to see it firsthand. For my close friends and family that can’t physically be there, I keep them in mind while I’m out there. So in a way they are still with me and are getting credit for miles whether they know it or not. Some people that are the most important to me get a lot of miles. Always share your treks and adventures with the important people around you; they will appreciate the miles you give them. 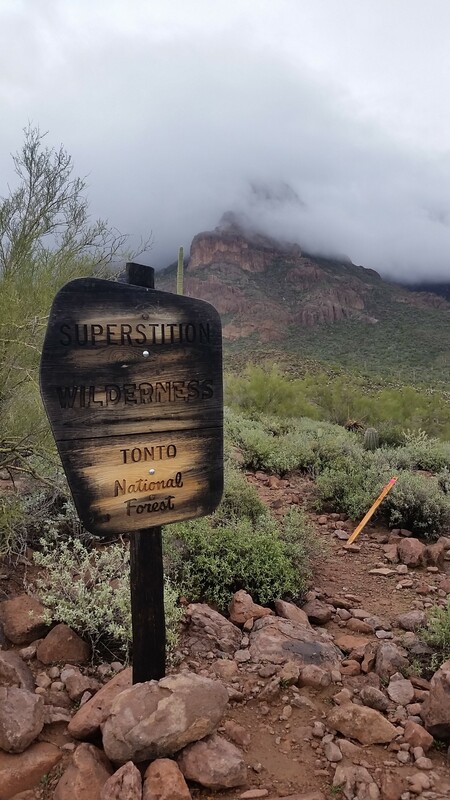 For this particular Superstition Mountain trek, I dreamed it up last minute the night before. I pieced a bunch of GPX tracks together that I found online. 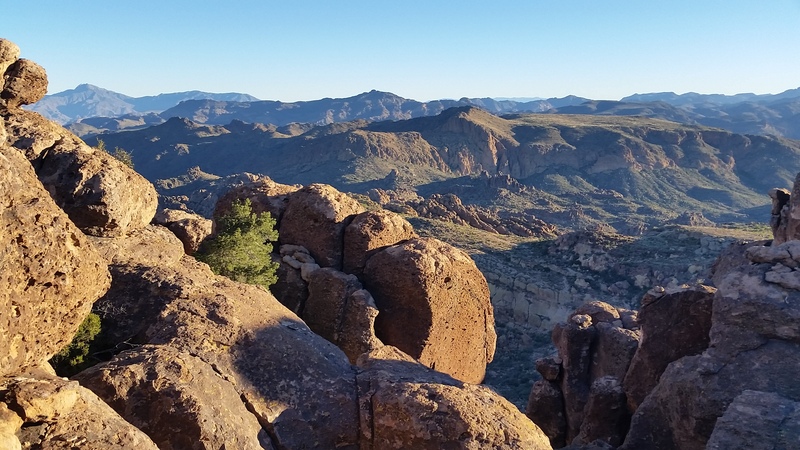 The final product was a big 15 mile loop that would touch a few key points in the southwest section of the mountains, including West Boulder Trail, Weavers Needle, Black Spring Mountain, and Miners Needle. 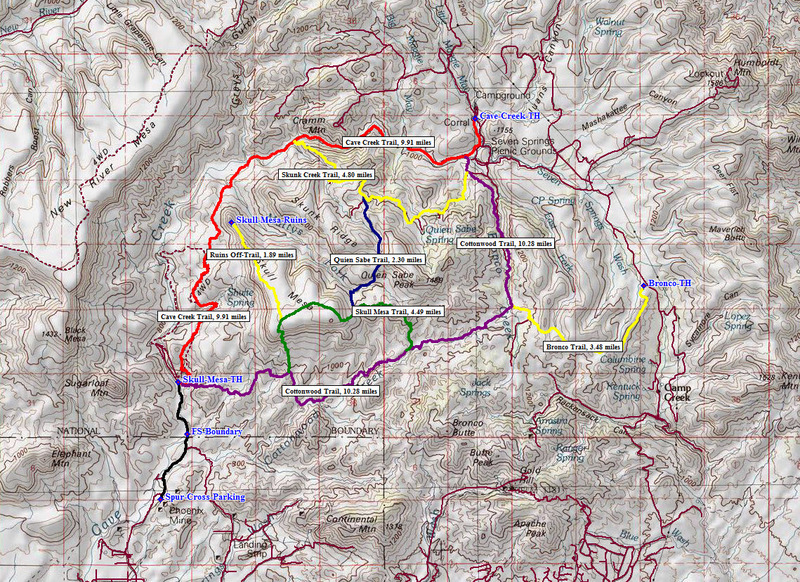 A little elevation gain, off trial mountain peaking, and main trail mayhem would round out this big loop trail medley (see Hike Info at the bottom of the post for specific trails, aerial map, and GPX). In the midst of dreaming all this up I was chatting with a fellow trekker Mark, who seemed on the fence for a few of his own treks, so I invited him to just roll with me. To my surprise he was immediately on board! 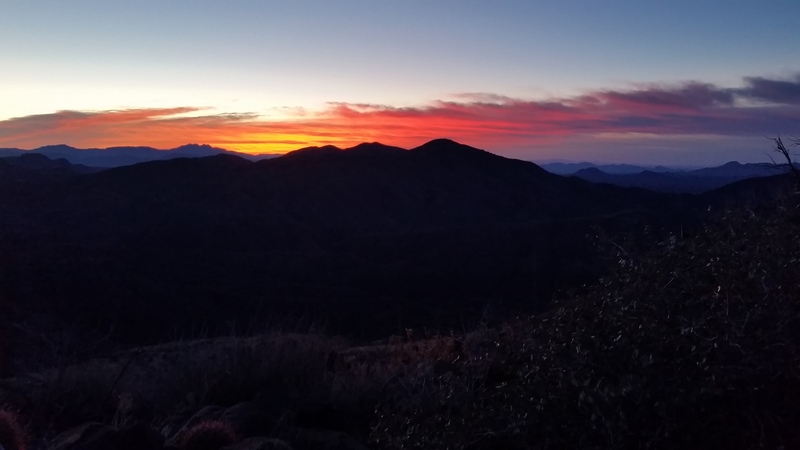 We met at dark thirty at Peralta trailhead just before the sun rose. Head lamps strapped on, packs filled with water, ready to roll. We walked along the road chatting about things going on in each other’s lives and how crazy and unexpected life can be. Before long we hit Carney Springs trailhead and the first big incline up West Boulder was on, the chat quickly subsided as we got to work knocking out the grind. Hearts thumping and low on breath we reached the top of the climb and turned to watch the sun rise in the distance illuminating the valley floor below. Something about watching the sun rise from a mountain top just seems right! Knowing we had to keep trekking in order to finish the loop by early afternoon we pressed on. 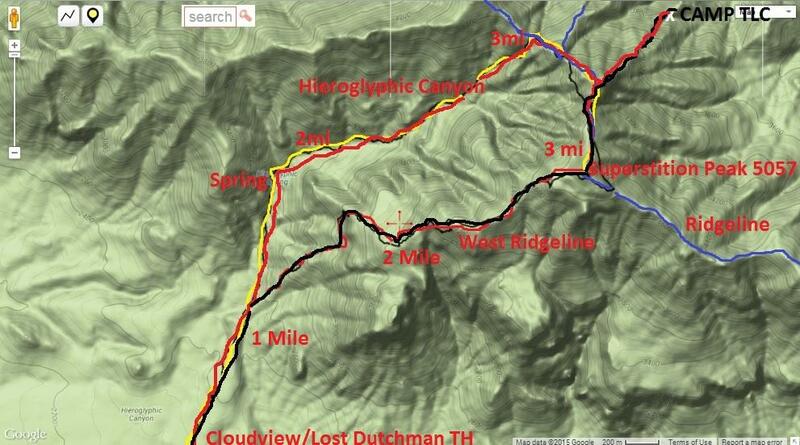 Using the GPX I put together and a topo map, we navigated through the boulderhop which is Decate Mesa Trail. Pushing through cacti and boulders we came out at an unexpected area of the “trail”. Thank god for GPS tracks! The cairns, although very helpful, seemed to be placed by several people each with their own agendas. Soon after some bushwack and rocky downclimbs we found our way to Fremont Saddle with a beautiful view of Weavers Needle in the distance. 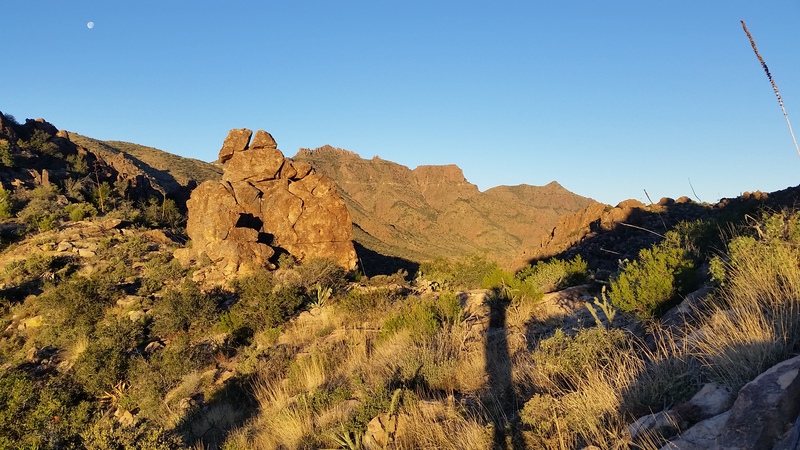 A small group of boy scouts was camped at the saddle and we gave them a friendly greeting before trekking on to the base of Weavers Needle. The well groomed trail helped accelerate us towards the huge rock formation and soon we were attempting to bushwack on the crosscut just south of the Needle to Terrapin Trail. We soon found that we had entered the wrong canyon and had to jump across to the next to press on. Once we were back on trail, the cairns and somewhat beaten route became a little clearer. Half way through the pass we ran into another group that looked pretty frazzled and sad. They had started hiking that morning at 4am to attempt to summit weavers and got a little “turned around”. We gladly pointed them in the right direction and kept trekking towards our next destination, Black Spring Mountain! We were soon climbing the spine of the mountain, and a wicked offtrail grind it was! I was chuckling to myself because just minutes before we turned up the killer grind, Mark had mentioned how the climbing was all over with! I didn’t have the heart to tell him we had just begun! 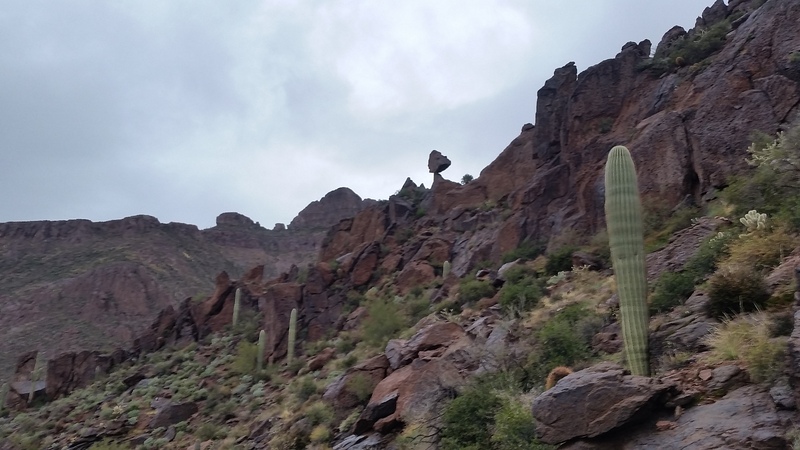 The climb up the spine was very vert, with only a few cairns spaced about ½ mile apart. Pressing hard up past a few small exposed areas and sharp boulders we reached summit! With gorgeous views all round we took a quick snack break and signed the registry. We departed the summit down onto a large mesa (all bushwack) leading to a lightly cairned use trail that descended us quickly to Black Mesa Spring Trail and soon after Dutchman Trail. We took the Dutchman Trail the final 5 maintained, snaking miles back to the parking lot where we left our vehicles that morning. Whenever we weren’t bushwacking or pushing up a big grind we were either marveling at the views around us or chatting about life and its complexities. Sometimes I like to trek solo and get some good grounding time with mountain, others times I like rolling with a friend and having a good chat. Whatever you do, make sure you share the journey. Carry the important people with you, however you do it, they will appreciate the miles you give them! Start at Peralta trailhead, Walk to Carne Springs trailhead, Head up West Boulder trail, to Decate Mesa trail, to Freemont Saddle tying into Peralta Trail, to Weavers Needle Crosscut, to Terrapin Trail, to Bluff Springs Mountain Trail, to Hidden Valley Loop trail, to Dutchmans Trail and finally back to the Peralta trailhead. I have a friend, his last name is Medal, that enjoys taking “the road less traveled” on pretty much every hike he goes on. Most of the time I stick to the trail, not even a fan of cutting switchbacks or disturbing wildlife, but I do love a true ascent to a peak. 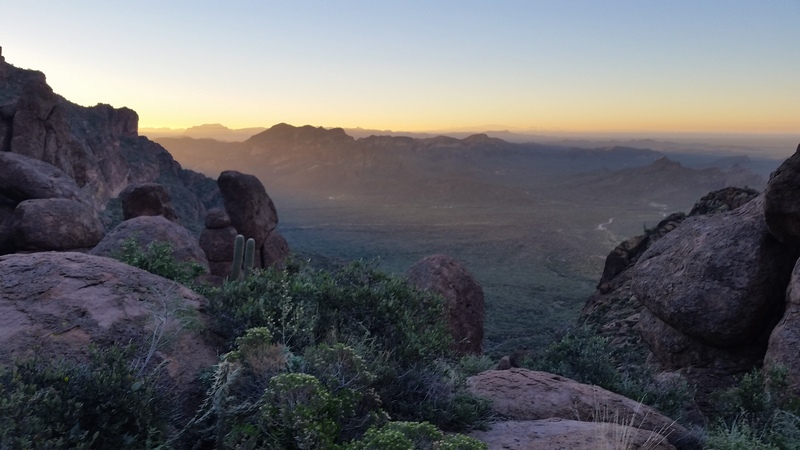 I had the chance to be invited to join a friend up a “route” in the Superstition Mountains from Hieroglyphic trailhead to the 5057 peak via the West ridgeline. I had hiked a nearby frequented trail to the peak up the canyon (which to be honest really isn’t much of a trail either in spots) to eyeball the route he proposed. There we a few spires that could pose a challenge in the ascent, but I said to heck with it lets roll! A group of us met in the parking lot, ponchos and rain jackets on to combat the sprinkling rain, and shining headlamps to light the way. 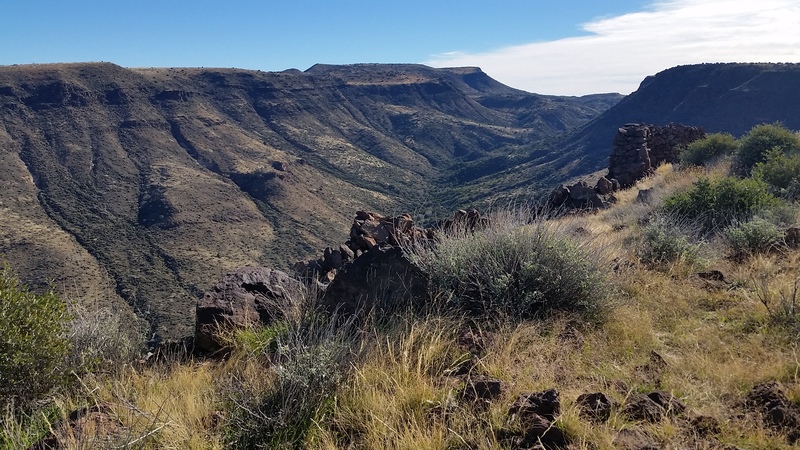 A large portion of the group would head up the more frequented trail up the canyon while a smaller group planned to split off to take on the west ridgeline about a mile into the hike. I was using a topo map and an aerial picture of the drawn route on a map to navigate the turnoff. Once I got there, as expected, it didn’t look like there was a trail. We busted up the initial ascent which didn’t wait in giving us some good laboring elevation gain right off the bat. Climbing up and up dodging barrel cactus, wet slick boulders, ocotillos, and a number of other brushes we pushed forward to reach the ridge. Along the way water trickled down the mountain off the rock faces in streams and sometimes small waterfalls. The sun, hidden by the clouds, slowly lit the sky enough to kill our headlamps. Soon after turning off the headlamps the heat from the climb and the breaking rain warranted a poncho peal. We climbed until hitting a vertical rock face. I followed the aerial topo (see HIKE INFO at bottom of post for aerial map) and we skirted north until finding a small gap that was well cairned that we climbed up and over. Dropping down on the North side of the gap and we saw a passable incline to the east to and made a final boulder hop (passing the teetering boulder) to the crest of the west ridgeline. Once we climbed on top of the west ridgeline it was surprisingly well cairned and the path was not too hard to follow. Absolutely incredible views! There is little that pictures could ever do to describe it. Peering in for miles every direction yielded awesome sights; the flat valley below, the gnarly jetting rock faces of the mountain ridges in the distance, much worth the climb. We continued to climb until finding another group of spires standing in our path. After some quick cairn searching we found the path dropping to the southeast side of the jetting rocks. Following the cairns and some old use paths we found a way to circumvent the massive spires. Climbing up and up on the ridge I was suddenly was overtaken by the overwhelming feeling of joy. Just being out there, on a ridge, in the middle of nowhere, with good people and breathtaking views all due to the effort I put into climbing that mountain: A cost well worth the prize. We kept trekking up the ridge with only one small 8 foot climb that all in our group easily surpassed (even Medals dog Tyson). After the climb the peak was in sight and we pushed on. Once we peaked I was surprised to see that only moments later the second group that took the main trail met up with us. Good timing! 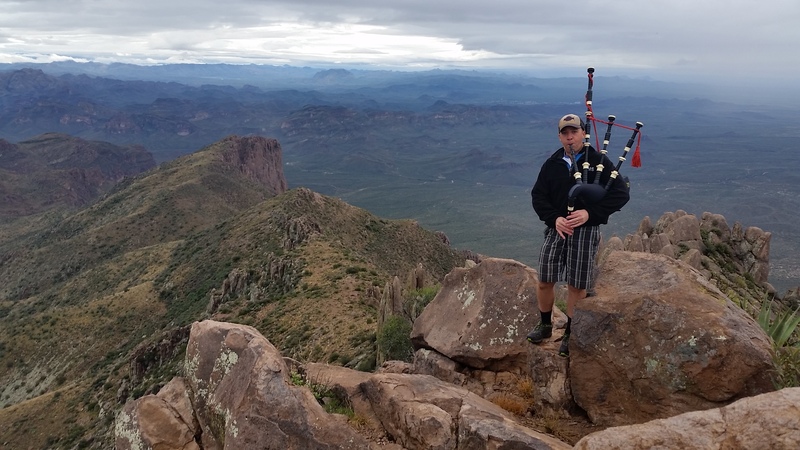 Buddy Mark killin it on the bagpipes at the 5057 peak! 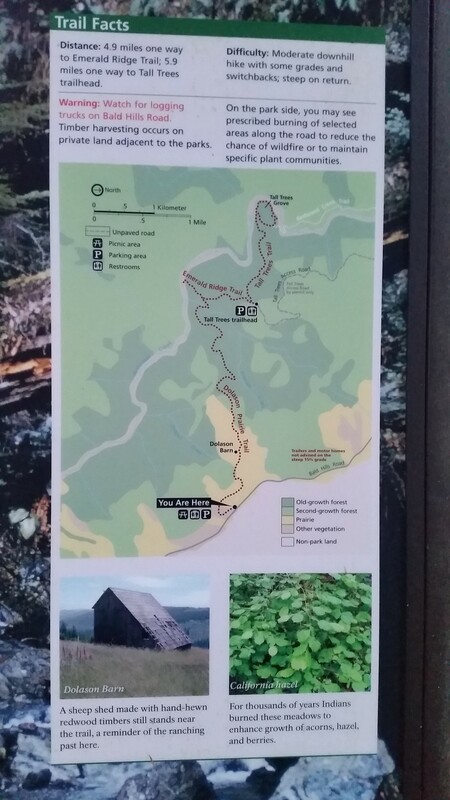 Once taking in the views at the peak and listening to my buddy Marks bagpipe session (unbeknown to any of us he lugged the things up there, sounded awesome, thought I was in a scene of Braveheart) we headed down the main trail towards the trailhead. Although the rocks were wet it wasn’t too slippery but caution was definitely needed. We dumped into the main canyon to find rare waterfalls running due to the past two days of rain in the area. This much water in the Superstitions was a real treat to see indeed. We kept descending down the faint cairned use trails, finally hitting the well worn trail at a confluence of two canyons. We took the trail down, around the bend of the canyon, past the petro glyphs (where most patrons stop climbing), and the down last mile to the trailhead. All the while we trekked down the mountainside a thick cloud descended on the mountain as if to chase us out of the wilderness. 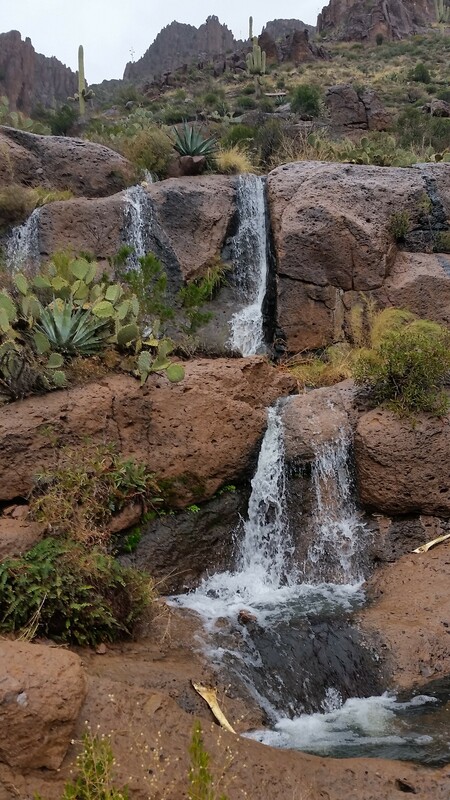 The weather was certainly kind to us and the prize of the views and rare sight of waterfalls in the Superstitions was well worth the price of a little sweat and effort. Another successful gorgeous trek! Moss and ferns, in the desert, who knew?! Killed my blasting alarm, grabbed my pack, and hopped in the truck to meet the Arizona and Beyond Backpacking group at Target in northern Scottsdale to coordinate a carpool to the Cave Creek Trailhead. 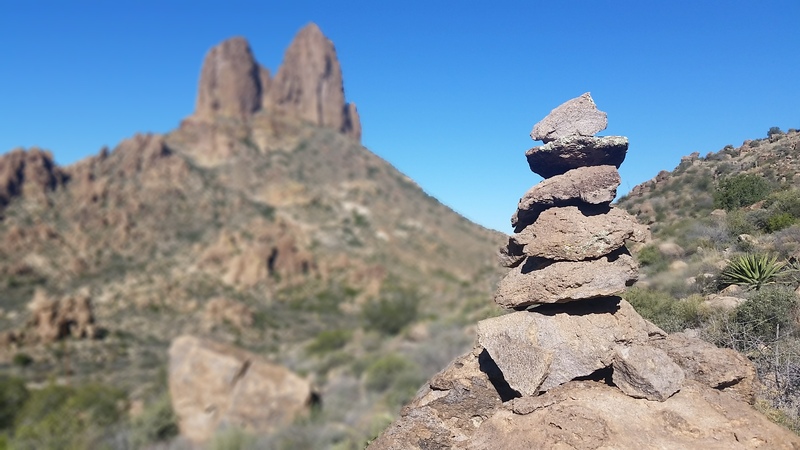 The plan was to trek in through Tonto National Forest to Skull Mesa, crash for the night, wake up in the morning to see some rarely seen Indian ruins, then loop back safely to the trailhead the next day. 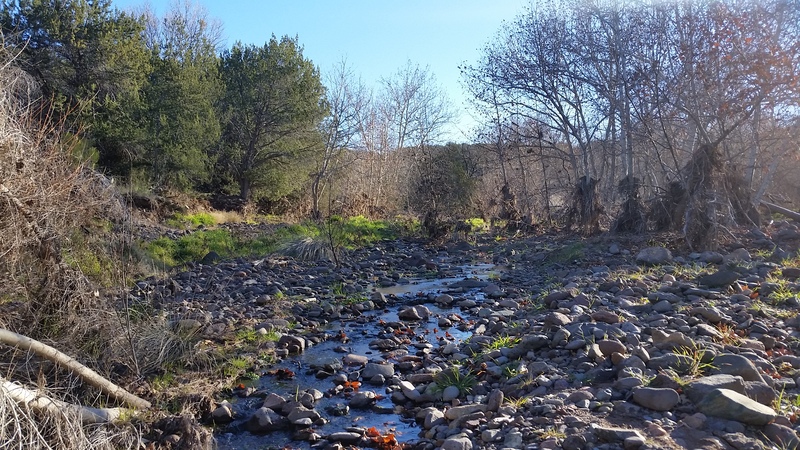 I did my diligence in mapping the trials, checking the weather, and making sure I had enough water to get through until the next day. What I wasn’t prepared for is some of the condition of the less traveled trails, and the fun it would take traversing them to our destination! The group headed south along Cave Creek #4 which seemed pretty straight forward. At the junction where Cottonwood Trail #247 tied in we crossed Cave Creek and it became a little less intuitive. With the help of a PGS and some pink tape we found the trail and kept on trekking. The trail opened up from the tree canopy near the creek bed as we ascending. Open views of canyons and the mountains ahead were all around. Soon we tied into trial #246 and as we pressed on I could see the separation in the group for different pace packs. It wasn’t until we hit trail #250 that things got really interesting. 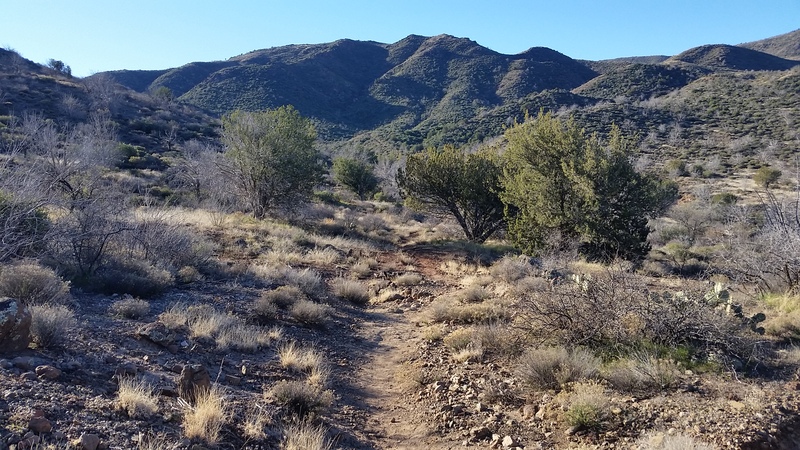 It seemed that the trail was an old mine road that nature reclaimed and covered in cacti and prickly bushes! There were baby boulders everywhere just waiting to claim an ankle. 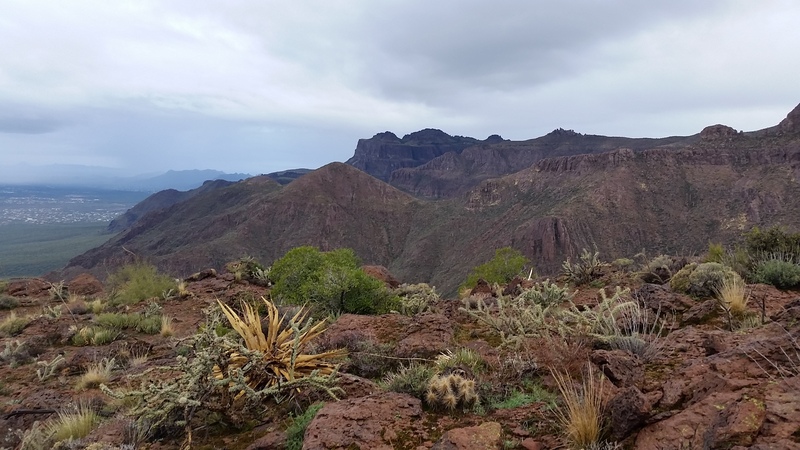 Three of us had gained a little time on the main group and decided to take a quick off trail trek to claim Quien Sabe Peak. The initial grind was formidable not lacking any rock, cactus, or bush dodging. We finally peaked, pausing to snap pictures and take in the landscape before turning back. We hit the trail once again, surprised not to see the rest of the group, but decided to press on to the Mesa and meet them there. Quien Sabe Trail #250 didn’t look like it has seen trail maintenance in quite some time and I wasn’t even sure we could call it a trail much longer in a few places. We pressed a hard grind up to the saddle and eventually the Mesa where we scoped out for a campsite. The rest of the group caught up and we set up camp. After a quick chill session, I caught a second wind and wasn’t ready to just settle in for the evening. 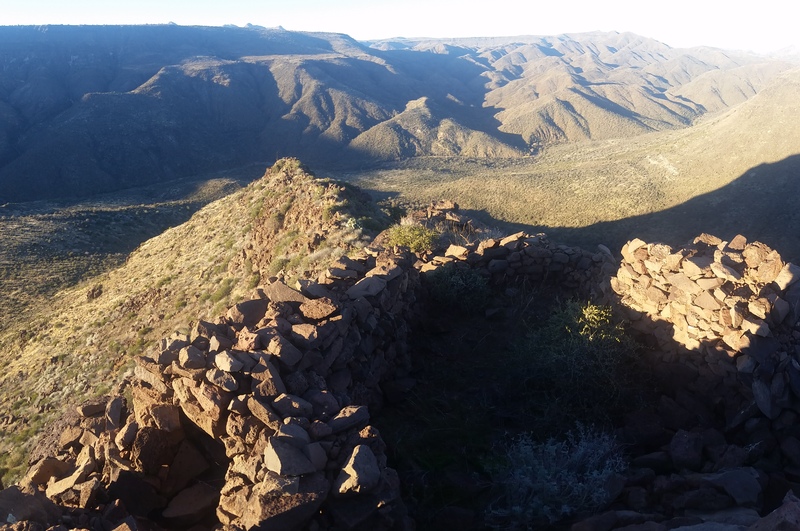 So with a few hours left of daylight I decided to make a push for the Indian Ruins at the north end of Skull Mesa and check out the down climb we would have to traverse the next day. I headed out at a quick pace with a mostly empty pack and a hankering to get some good pics of the ruins in the golden light. The mesa is large and flat, sometimes it was hard to get my bearings in the open fields. The pancake cacti were waiting like landmines to remind me it wasn’t just a walk in the park. After an hour I reached the ruins after traversing 2 miles of mesa and two surprisingly steep hills on the ridge line walk. I snapped pictures, looked at the super sketch (looking) wash we would have to descend the next day (with 30 lbs packs), and headed back for camp to try and beat the onset of night. I reached camp, told everyone what we would be facing the next day and proceeded to make dinner and chill out just before crashing for the night. As light faded Brian (physics teacher) schooled us on the constellations and locating the North Star. Was nice just hanging out a chatting with almost strangers all out there for the same reason, to enjoy nature. I called it early and crashed out. The next day I woke early with coffee in hand and met Vince and Brandon (2 of the trip coordinators) at the edge of the Mesa to catch the sunrise and talk about the days journey ahead. 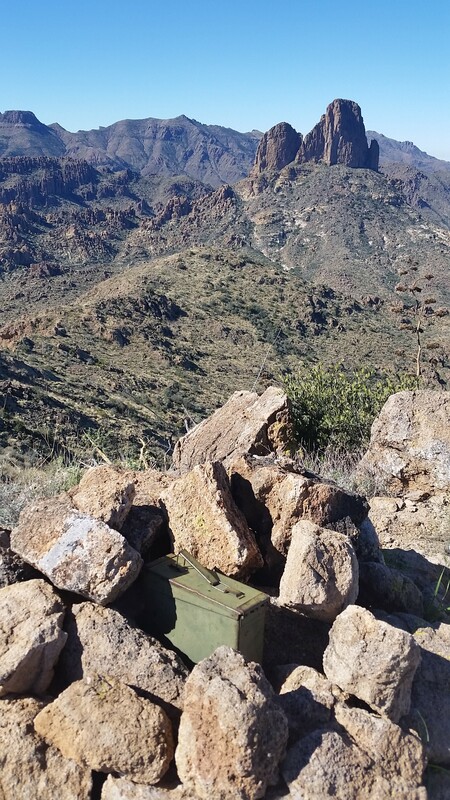 After a while the troops were gathered and we set out, traversing the mesa, checking out the Indian ruins, and finally descending the rock was on the west side of the ridge just before the ruins. The rock wash was a bit tricky, and definitely had the looks of doom at first glance. 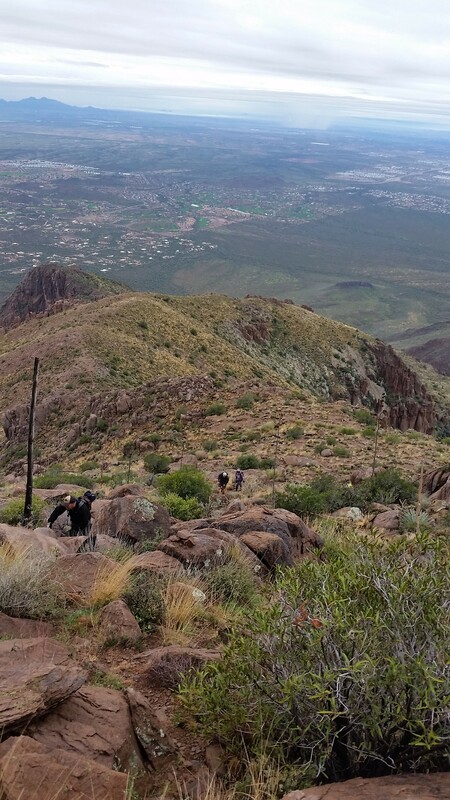 It took some vigilant navigation and shore footing to get us down safe, but we all made it (with a few extra cacti spines that we started with). We tied back into the Cave Creek Trail #4 and headed back for the trailhead. After a mile we hit the creek, took a break for food and to filter water. The trail seemed to wind alongside the creek for the most part. 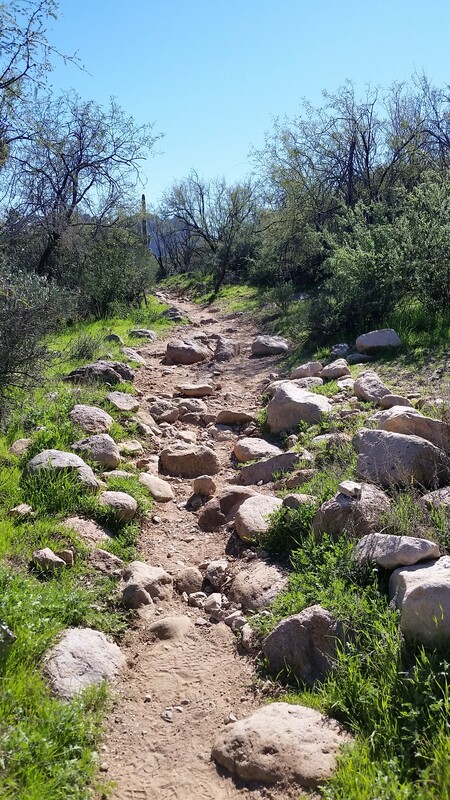 I was really interested by the Cave Creek Trail #4; it had some very unique (especially in Arizona) qualities. 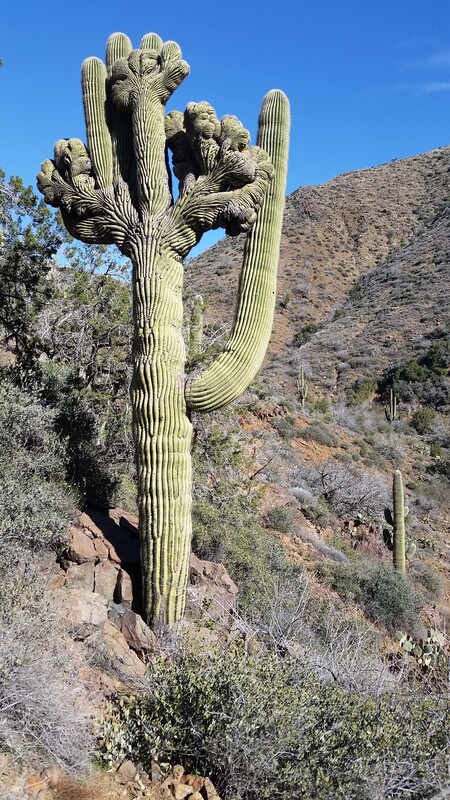 Inviting swimming pools, green lush trees, fresh flowing creek water, and a very cool crested saguaro were all trailside. The trail rolled in and out, up and down the canyon, through some very green grassy canopy areas, and finally back to the trailhead. Two days outside with nothing but fresh air and plenty of dirt to put beneath your boots, what could you want more?! Well thats one way to hop a fence!